With their best defenseman so far this season out of the lineup indefinitely, the Winnipeg Jets and their young defensive core have a large and meaningful task ahead of them. And Tobias Enstrom's broken collarbone isn't the only thing that is keeping the young core busy either. Injuries to Ron Hainsey, who is slated to return before the new year at latest, and subsequent day-to-day injuries to Randy Jones and Mark Stuart (who managed to get into the lineup and play 18:10 of ice time last night) have put the onus on the young defense of the AHL's St. John's Ice Caps to fill the roles needed. And filled these roles they have. After calling up both Brett Festerling and Mark Flood when Jones and Enstrom were not available, both have made the most their opportunities in the NHL. Flood had his first career goal and a two-point night against the New Jersey Devils and has so far had a +1 rating through three games in Winnipeg. Flood has also seen his stock rise at the same time, with his minutes improving over 15:00 of ice time after his two point performance in New Jersey - where he played a career high 19:44. Festerling, on the other hand, has seen his stock drop a bit. After playing 19:05 of ice time against the New York Islanders, his ice time went down to 15:37 with a -2 performance against New Jersey and it plummeted last night to only 7:45 of ice time in New York. Paul Postma, the other emergency call up for the Devils game when Stuart couldn't go, played 13:37 in New Jersey, only to have three shifts in New York last night with the return of Stuart. Experience is key and for the Jets, these three defensemen have proven that they can step in and make an easy transition. Though the next call ups may see the names of Zach Redmond given a try or another Mark Flood call up, but the Jets defensive depth has proven to be a key cog in the Jets machine, despite the 1-1-1 record with the call ups in the lineup. Most importantly, Flood has seen his stock rise higher than ever in his career. 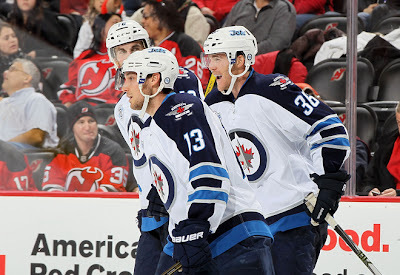 After spending last season in Winnipeg with the Moose for an entire season, it seems he has learned both sides of the puck and will be counted on to add to the Jets defensive depth. If another team comes knocking on the door for defensemen, Mark Flood will not be the first to go.